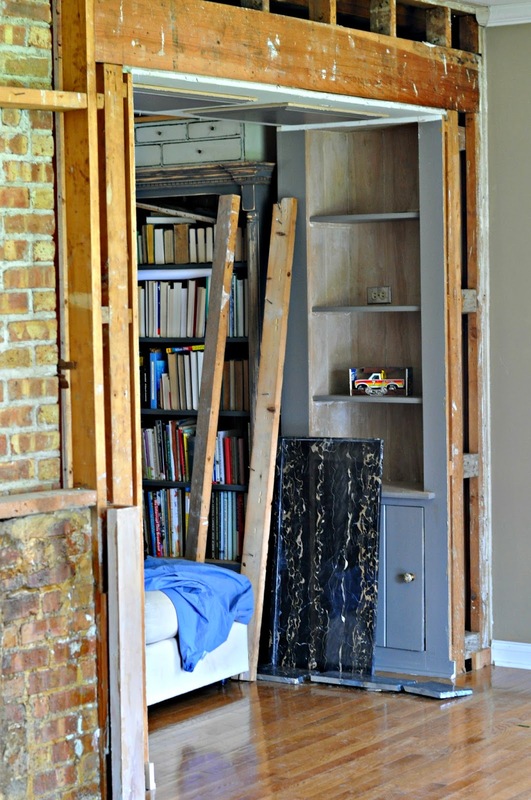 As I was saying, I couldn't wait to see what was back there for several reasons: First, it was pretty apparent to anyone with even marginal eyesight that the inside of the cabinet had been hacked up by someone and it was probably because of the kitchen "renovation" that happened within the last five years. 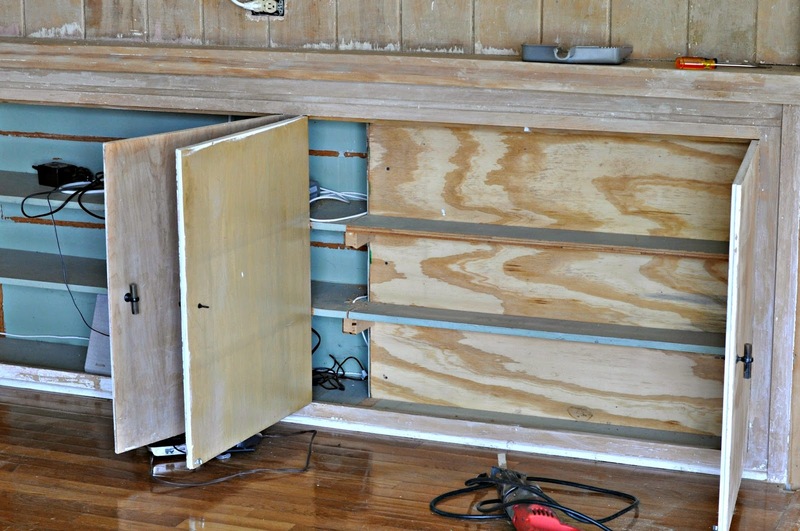 Second, when we attempted to attach the mounting bracket for our television to the paneling last fall, we quickly discovered that the studs had been randomly cut off and didn't go all the way to the ceiling...odd...but maybe there was a reason. Third, I'm looking forward to having all of the outlets on the same breakers and having the switch on the wall control something in the room...currently, it appears to control nothing...unless it's the lights in the garage on the other side of the house...that's always a possibility. Last but certainly not the least of my curiosities was why the ceiling height in most of the house is 8 feet 4.5 inches. I know, right?! I've been perplexed for awhile but I had decided that whatever the reason was, it also likely had something to do with why the fireplace hearth was 3/4 of an inch below the flooring. 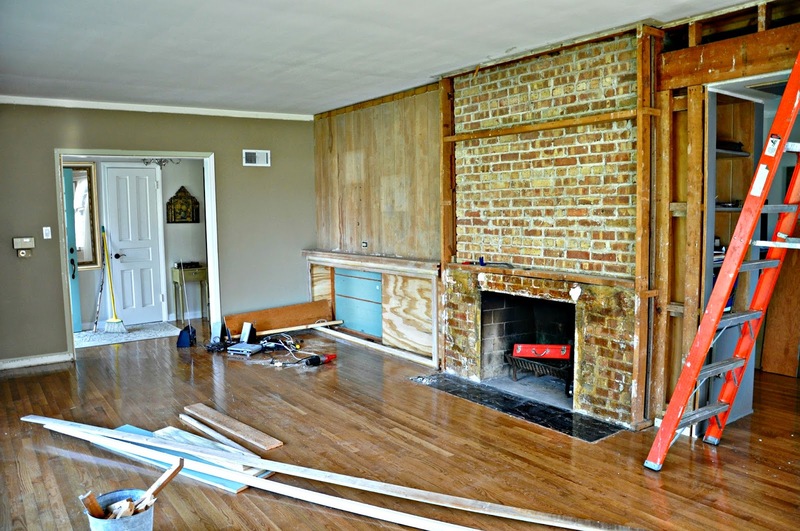 On Monday and Tuesday, all of those questions were answered when we finally removed the last of the maple paneling along the fireplace wall in the new dining room. 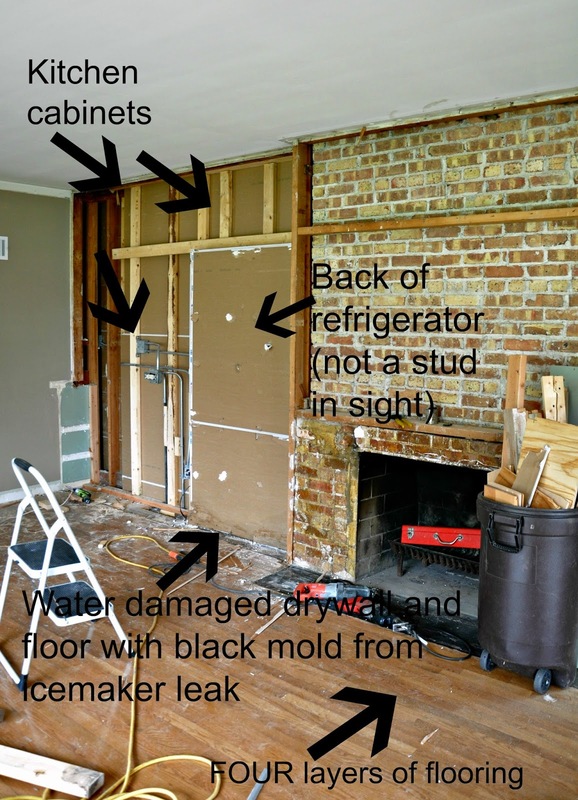 The inside of that wall was a hodge podge of framing, plywood and, in some places, just drywall (with no studs) that was apparently re-muddled during a kitchen renovation that I can only assume by the quality (Yep, that's sarcasm) of the workmanship, was done without a permit. On the other side of the wall is my current kitchen. That mess was holding up my kitchen cabinets. Fortunately, when the ice maker sprung a leak this winter (causing it to rain in my basement at 6 in the morning), I uncovered long term damage to the floor and the wall so it was going to have to be taken out anyway but yesterday I became fully aware of just how thankful I am that the kitchen is being redone during Phase 2. Black mold on the wall and the first layer of flooring. 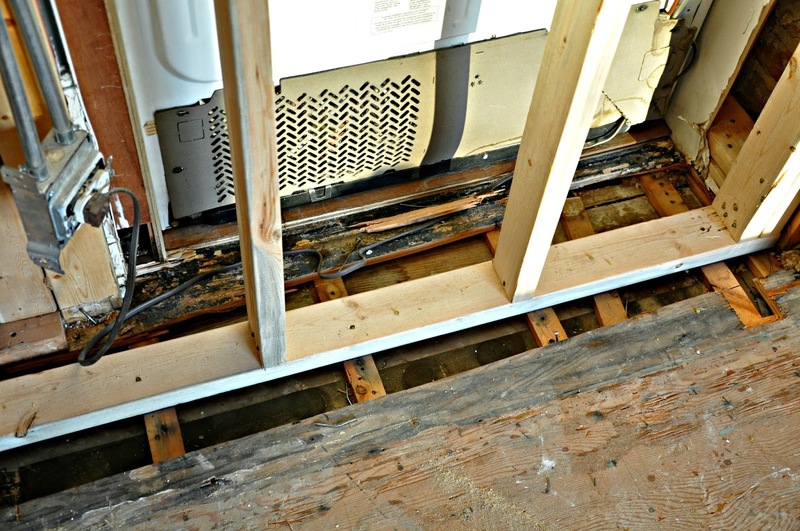 I also found out that the reason for the odd ceiling height is that there are four layers of flooring which I am removing to the original underlayment and "sleepers" and over which I will be installing one layer of hardwood . The new ceiling height will be 8 feet 6 inches! There's still a long way to go but these are steps in the right direction. As of Tuesday afternoon, the framing is complete. 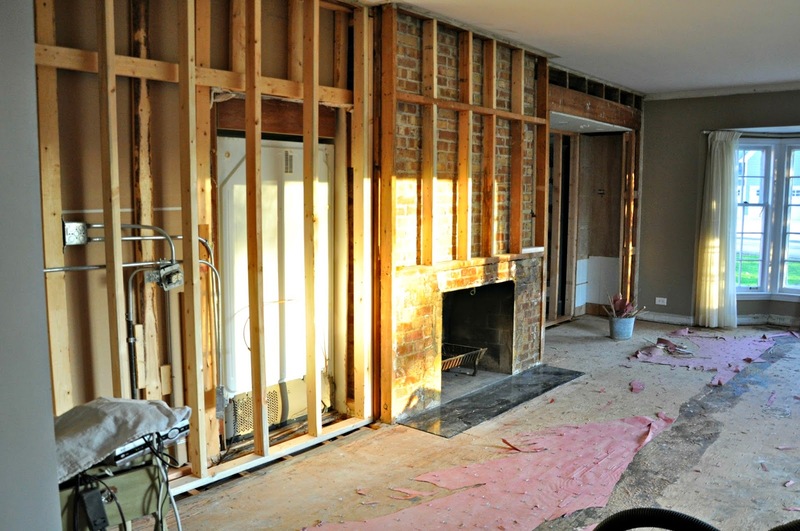 Up next: new wiring and electric in this room then drywall (these will be done by the pros). 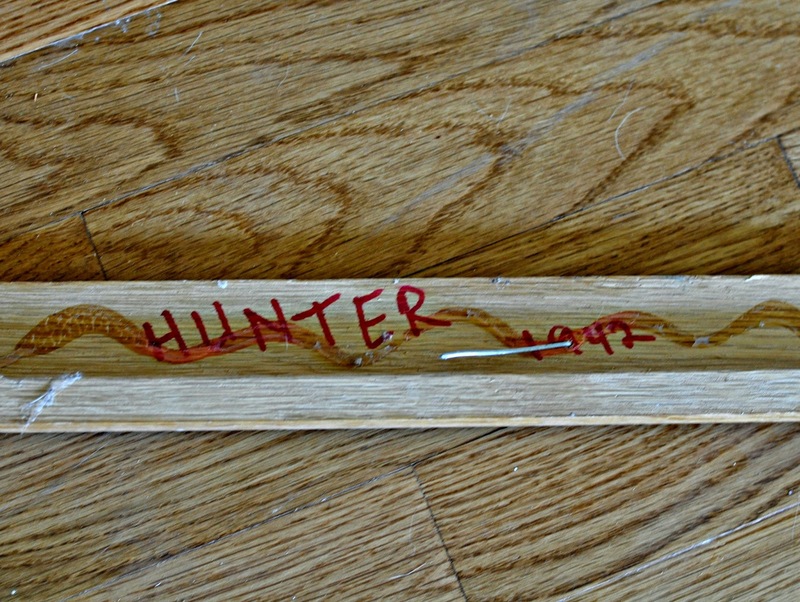 Then, I'm going to learn how to install the new hardwood floor (at least that's the plan as of today)! 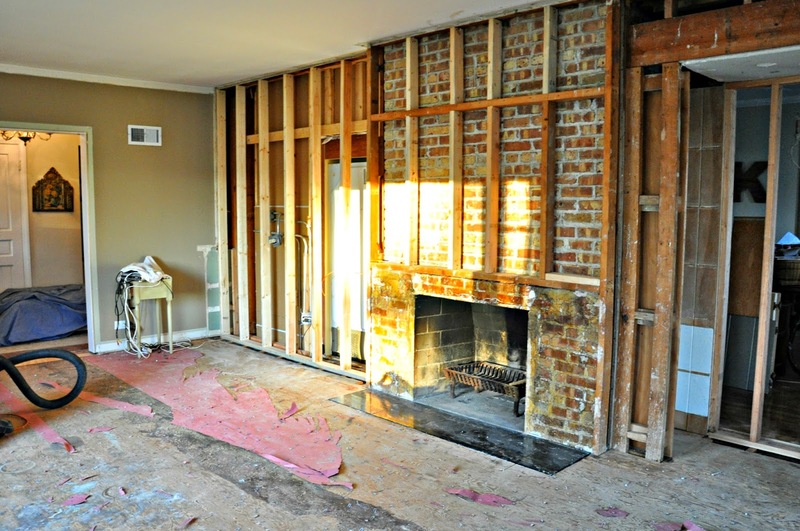 The fireplace mantel and hearth will be handled by the pros. Due to the condition of the brick and the fact that there was no way to get electrical into the wall, I decided that it was best to cover the brick and have a limestone surround made (even though it broke my heart). Window replacement will also be done prodessionally. Finally, I'll be installing crown molding and trim and doing the painting. Please keep in mind that none of this will happen over night as I still have a full time job and a family (as well as some new retail adventures that you can read about HERE). I'm DIY'ing this project on nights and weekends as time permits. Thanks so much for joining me on this journey. 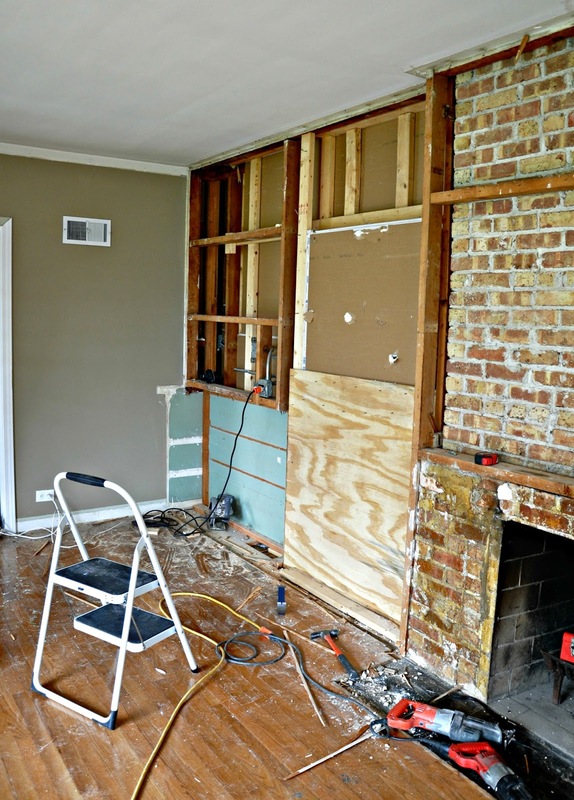 Your support and kind words get me through the crazy parts of this renovation and if I can help even one of you to avoid making the types of mistakes that the prior owners made in this house or to correct mistakes when you uncover them, then all of this is worthwhile.